Discover how you can get your share of the greatest gold salvage operation, ever! Why is there GOLD at the bottom of the ocean? During World Wars 1 & 2 the British Government shipped gold bullion to pay for critical war supplies. It was the greatest physical movement of gold in history. It's well documented that during both World Wars, more than 7,500 British merchant ships (half of all British ships) were sunk by enemy fire. Exclusive research has identified more than 700 of those ships were designated as "official gold carriers", carrying gold and other high value cargo out of the UK to pay for war supplies such as food and munitions. 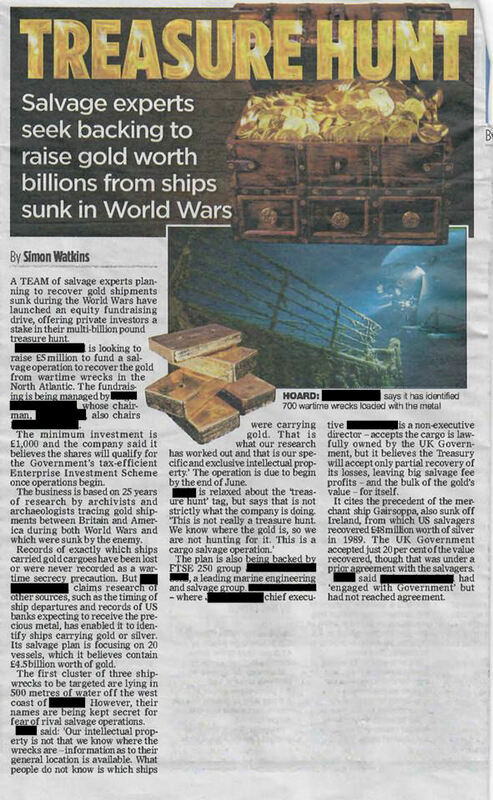 The estimated present day value of the gold and silver contained in those sunken ships is around £145,000,000,000 pounds. 25 years ago amongst a box of wills of deceased sailors, a document was found that was written by an adviser to the wartime UK Chancellor of the Exchequer, Reginald McKenna. The document clearly indicated secret gold movements made on behalf of the government on requisitioned merchant liners. 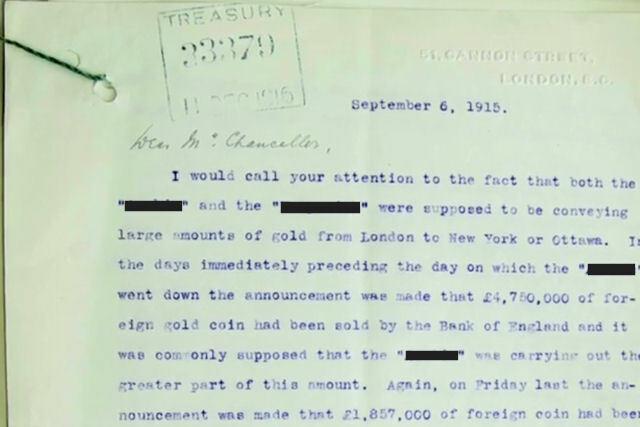 The document identified the names of the Liners and the value of gold each were carrying. 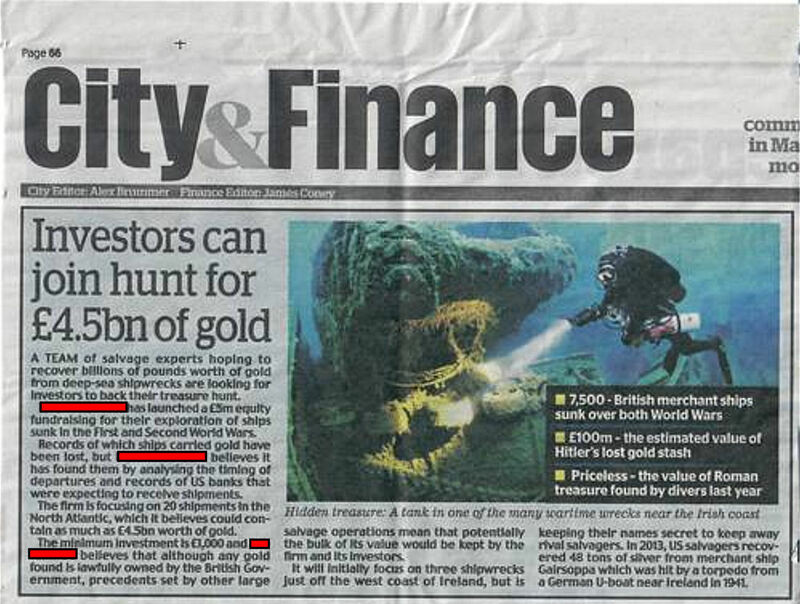 This discovery resulted in a small team of international researchers to spend the next 25 years systematically investigating maritime and financial institution archives, both in the UK and overseas for more details. 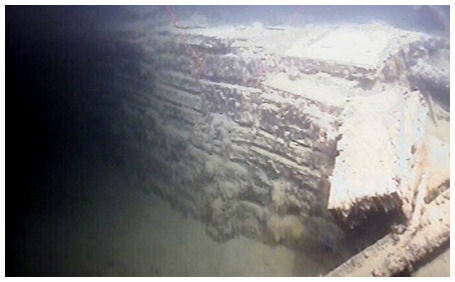 The team collated a database of unique intelligence, giving wreck location and cargo content on over 700 merchant liners that were used to transport gold and other precious materials from the UK. A total of 8 million pages of information has been compiled, giving documented evidence of the names and locations of shipwrecks plus details of the cargo they contain. Having the information on where the high value shipwrecks are located is one thing, but having the skills, equipment and the finance to carry out the salvage is a different matter. The wrecks in the Atlantic are too deep for "normal" divers which means salvage operations need to be carried out using remote operated vehicles (ROV), sophisticated cameras and advanced cutting technology. The UK government would not be in a position to spend public money on such a high risk and expensive operation. The only way to fund a project of this complexity and cost was through private finance. Late in 2016, the founder of a small investor Club (The Angel Business Club) hosted a private dinner party for a few close friends. One of the people sat at the table mentioned a friend who was attempting to crowdfund for a gold salvage operation. During 2017 and 2018, The Angel Business Club asked their network of investors if they wished to invest and the Club duly raised around £8 million - the funds necessary to start the salvage project. 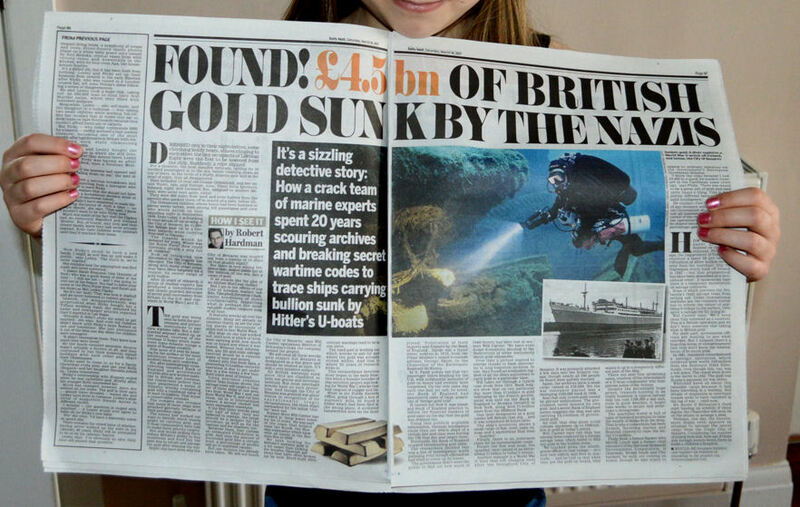 A business was formed (Britannia's Gold Ltd) consisting of a team of top marine salvage experts. 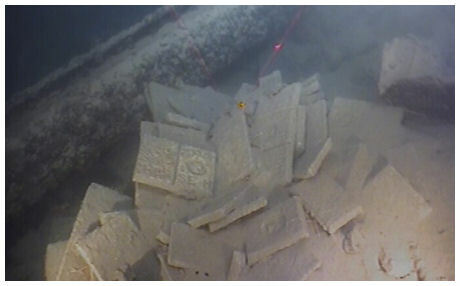 Research had identified 5 specific target wrecks believed to contain high value cargo in the North Atlantic. 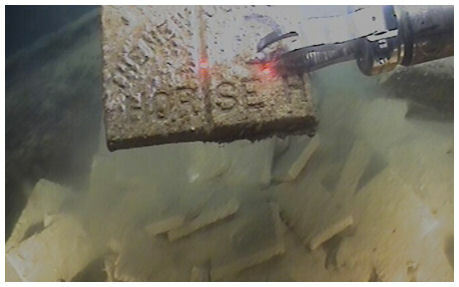 In 2018, the salvage team carried out a detailed survey. The purpose of the survey was two fold. Firstly, to verify beyond reasonable doubt the positive identification of the correct shipwrecks and secondly to check the condition of the wrecks. 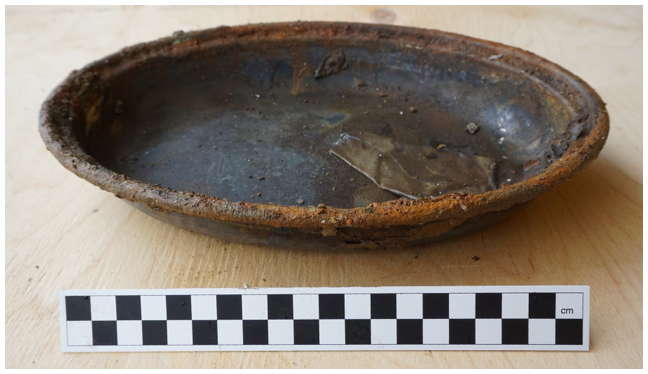 From one of the wrecks a silver plate was retrieved (see photo). 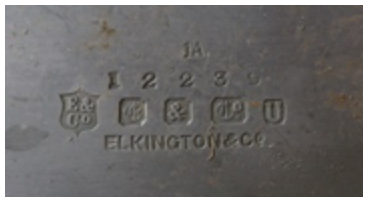 The makers hallmark, Elkington, can clearly be seen, but more importantly, the shipping company’s logo was also verifiable (see photo). This gave the team 100% confidence the correct shipwreck had been found. 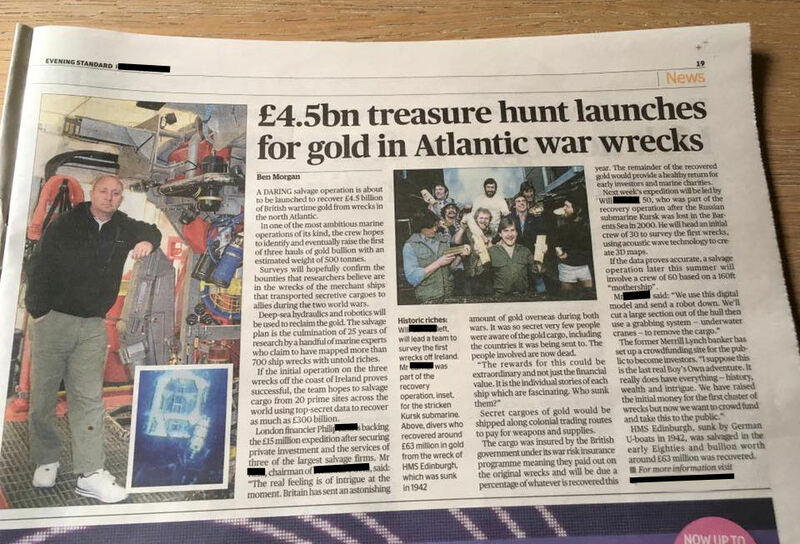 These "easy to reach" items also indicated that no other salvage attempt had been made, giving further confidence the gold and silver is still there to be collected. The survey in 2018 also gave excellent visual identification of other desirable cargoes being carried by the ships. For example, a large volume of tin (sn) (see photos below). 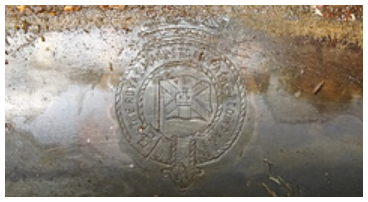 Further cargo identified during the survey included zinc ingots (Zn), complete with the manufacturers stamp still visible, (see photos below). Tin and Zinc are still in high demand in today's metals markets and given the considerable volume on the wrecks, the salvage team plan to recover these metals at the same time as the gold and silver. GOLD SALVAGE - It's happening now! The funds to pay for the survey and salvage operation (c. £8 million) were raised by private investors during 2017 and 2018 and the full salvage is now underway on the first target. 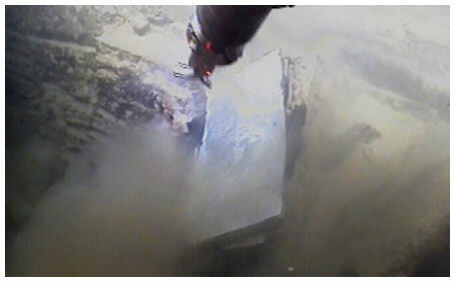 3 shipwrecks are included in the first salvage operation and the first salvage is likely to be completed any day now. Philip Reid, Chairman of Britannia's Gold, has given several interviews to various media. Here's the interview he gave with BBC Radio 5 Live (click to play the video below). The Discovery Channel have also expressed interest in making a documentary. Will has spent over 30 years working in the marine sub sea industry. 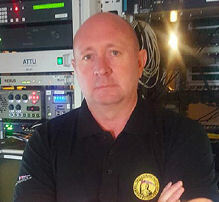 He has been involved in some of the world’s largest and most challenging marine engineering and oilfield sub sea construction and decommissioning projects, including the Piper Alpha disaster, the recovery of the Kursk and the salvaging of the Francois Vieljeux. Mauricio has been actively involved in responding to more than 350 major global ship and cargo salvage incidents, first as Casualty Surveyor for Scandinavian Hull and Liability insurers and later as Salvage Master for international salvage companies. Since 2008, Mauricio has been President of Houston based T&T Salvage where he manages global operations. 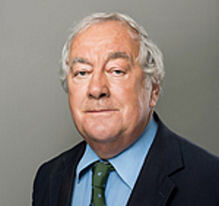 Nick Henry is the CEO of James Fisher & Sons plc, Britain’s largest and oldest Marine Services company. James Fisher & Sons PLC have over 2,500 employees and cover an extensive range of marine activities including salvage services. Nick brings a wealth of experience from the sub sea and salvage world. 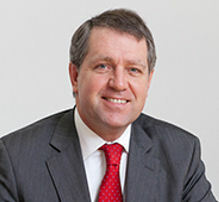 Nick was appointed CEO of James Fisher and Son’s plc in 2004. 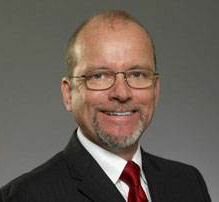 Mr Reid has over 35 years of experience in financial services. He was a Chief Executive of the National Research Development Corporation, a Government backed venture capital organisation. He was later a Senior Vice President of Merrill Lynch has been Chairman of five Listed public companies. Mr Reid is also the co-founder of The Angel Business Club. Who are The Angel Business Club? The funds to pay for the salvage operation have already been raised by a private crowdfunding campaign created by the small investor club, The Angel Business Club. The Angel Business Club is a savings and investment Club with around 2,000 active members around the world. The Club invests in high risk/high reward opportunities such as Britannia's Gold. 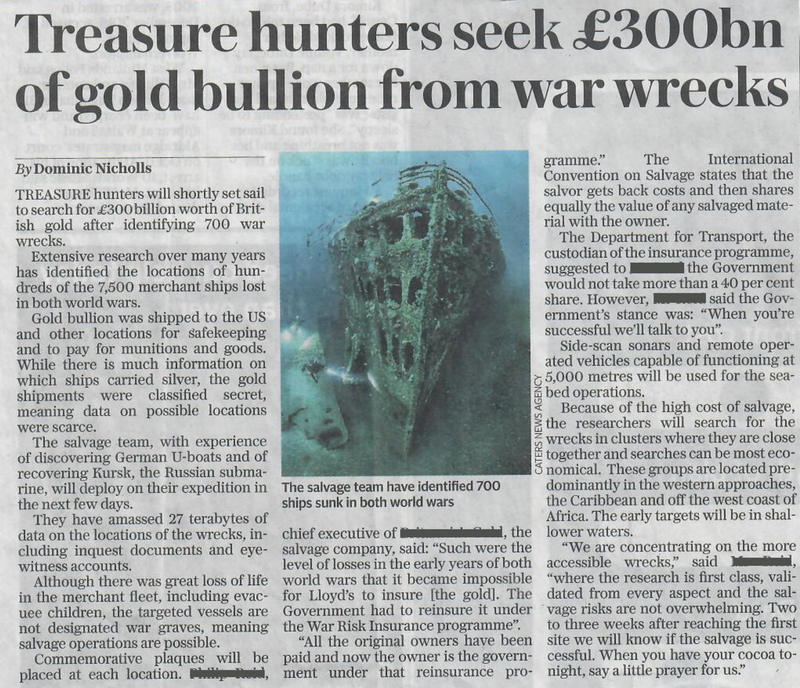 All the gold and other valuables recovered during the salvage operation will be shared between the UK government who are the official owners (c. 40%), shareholders of Britannia's Gold Ltd (c. 50%) and war charities (c. 10%). The Angel Business Club owns a significant stake in Britannia's Gold Ltd and will be paying out its share of the gold dividends to members of The Club according to how many Britannia's Gold Dividend Units ("Gold Units") each member has. Join the Angel Business Club in April and you will receive Gold Units as part of your share allocation. Each Gold Unit qualifies you for a cash dividend from this and all future salvage operations. It's unlikely Gold Units will be issued beyond 30th April 2019. Secure as many Gold Units as you can by joining The Angel Business Club today. Another great reason to join the Angel Business Club... SHARES in early stage businesses! By joining the Angel Business Club today, not only will you receive Gold Units in this exciting salvage project but every month you will also receive free shares in early stage businesses. These are not publicly traded companies (these are very early stage). You cannot buy these shares on any stock market. These are real shares in small, privately owned businesses that you would not have access too any other way. In simple terms: The Angel Business Club gives ordinary people an affordable way to access extraordinary opportunities including this unique gold salvage operation. If you've ever seen Dragons' Den or Shark Tank on TV, this is your chance to become a Dragon or a Shark without the large financial risk. Why not tell your friends about this brilliant opportunity? Join the free affiliate program and the Club will reward you with cash for sharing this exciting opportunity with others. Login to your back office and click on "settings" and tick the box that says you want to take part in the "networking affiliate program" and you can start sharing immediately. HELPFUL TIP: Your member ID is the 5 digit number listed in your back office in the "account summary" section. Do not consider information on this website as business or investment advice and understand the information on this site has been created by an independent affiliate and is not approved or endorsed by the Angel Business Club. Capital at risk.